Today my guest is Jake Keeler. Jake is a former AHA governing committee member, and he is chair of the current Industry panel. He also works at BSG, a major wholesale provider of beer brewing equipment and ingredients. We discuss the 2018 Homebrew Industry survey which is published annually – it is a survey of mainly retail home brewing outlets in the US. 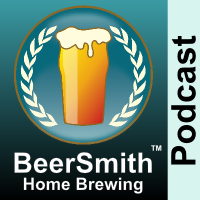 We discuss some of the long term trends in US homebrewing including the slow decline in sales which started a few years back. Another trend we cover is the substantial move from extract to majority all grain brewers which continues. Jake explains the sale of beginner kits and which have been declining a bit, but also how many brewers are coming directly into all-grain. We talk about the “Amazon effect” and the continued growth of large online retailers at the expense of some small suppliers. We cover a few other topics such as wine making kits from the survey and Jake provides his summary. Jake shares his thoughts on another topic – which is simply “making homebrewing fun again”. He gives his closing thoughts. Great podcast! Our shop participates in the annual survey. Great to hear from Jake Keeler!